Patriots tight end Rob Gronkowski had to be helped from the field in the fourth quarter. DENVER — Just like that, the Patriots have lost a game. Perhaps more. C.J. Anderson’s 48-yard touchdown run in overtime gave the Broncos a 30-24 win over the Patriots on Sunday night at Sports Authority Field at Mile High. But the bigger loss may have been to standout tight end Rob Gronkowski, who left the game on a cart after suffering an injury to his right knee. Gronkowski went down with 2:49 left in the fourth quarter and the Patriots leading, 21-17. He was in the postgame locker room with his teammates, but declined to speak with reporters. Gronkowski did not need assistance to walk out of the locker room, a positive sign. A league source said the initial diagnosis of Gronkowski’s injury is that it’s not thought to be serious. “All of our fingers are crossed,” said quarterback Tom Brady, who threw for 280 yards and three TDs. The loss dropped the Patriots to 10-1. And while the pursuit of a perfect season is suddenly over, of far greater concern will be the health of Gronkowski, who has had two previous seasons end because of injury. Both times, in 2012 and 2013, a team with Super Bowl aspirations came up short. Read: On Football: Was Gronk’s injury a knockout blow? On a wintry night in the Rockies that turned the stadium into a snow globe, with flurries falling and snow shovels clearing yardage and out-of-bounds markers, the Patriots wasted a pair 14-point leads, including one in the fourth quarter, then needed a 47-yard field goal by Stephen Gostkowski on the final play of regulation to force the extra session. The Patriots, who scored the game’s first 14 points, took a 21-7 lead in the first minute of the fourth quarter on a 63-yard pass from Brady to Brandon Bolden. But a muffed punt by Chris Harper less than a minute later gave the Broncos a short field, which they turned into a 15-yard touchdown run by Anderson to trim the Patriots’ lead to 21-14. Two Patriots penalties on their next drive — one of which wiped out a 51-yard completion from Brady to Keshawn Martin — forced a punt, which also was muffed, this time by Denver’s Omar Bolden. But Bolden recovered, which led to a 21-yard field goal that cut New England’s lead to 21-17. After the teams traded punts, the Patriots took over at their 25-yard-line with 4:19 left, still leading by 4 points. Three plays later, Gronkowski was sprawled on the ground, writhing in pain, after a pass that was intended for him fell incomplete. It left an already thin Patriots offense even more shorthanded. Needing a touchdown to take the lead, the Broncos used five plays to go 83 yards. The drive started with a 36-yard pass to Demaryius Thomas — his first catch of the game on the 11th pass sent his way. A 39-yard completion pushed the ball inside the Patriots’ 10, and Brock Osweiler hit Andre Caldwell on a 4-yard touchdown pass with 1:09 left. Denver’s first lead of the game was 24-21, inside the final minute of regulation. Brady led the Patriots on a game-tying drive, hitting Scott Chandler for 22 yards and Brandon LaFell for 14, setting up Gostkowski’s kick, which split the uprights and forced OT. After a three and out on the opening overtime possession, the Patriots punted the ball from deep in their territory. On third and 1, Anderson ripped around the left side of the line and sprinted into the end zone, capping the comeback by the Broncos (9-2), who now have won two straight games under Osweiler, filling in for injured quarterback Peyton Manning. Shorthanded? You could say that. The Patriots came into the game missing three of their top four receivers, with Julian Edelman (61), Danny Amendola (49), and Dion Lewis (36) combining for 156 catches on the season. Add Aaron Dobson’s 13 receptions, and 62 percent of the Patriots’ 271 catches through the first 10 games were by a quartet that was unavailable on Sunday night, all because of injury. Any concerns about the Patriots being hesitant to throw the ball with such a depleted pass-catching posse were erased the first three times they had the ball. They called for a pass on their first nine plays, and used the air approach to grab a lead less than four minutes into the game. Not counting special teams whiz Matthew Slater, the Patriots dressed only three wide receivers — LaFell, Martin, and Harper — and they had combined for just 23 receptions on the season coming into the game. LaFell and Gronkowski alternated on the first drive, catching all four passes from Brady on a 47-yard touchdown drive. Gronkowski took it the final 23 yards, giving him nine touchdowns on the season and 64 for his career. Those 64 scores are more than every tight end currently enshrined in the Pro Football Hall of Fame. The Patriots didn’t run the ball until their third drive, a short gain by LeGarrette Blount. That drive stalled at the Broncos’ 42, with the Patriots opting not to go for it on fourth and 1. Curious decision, but the choice to punt the ball and play a field position game paid off minutes later, when Osweiler was pressured and hit by Jabaal Sheard while attempting a pass. The ball was knocked high into the air, with Chandler Jones coming down with it, the first interception of his career. Jones’s pick set up the Patriots at the Denver 15, and they needed just three plays to double their lead. Brady connected with Chandler on a 9-yard touchdown pass; Chandler’s third touchdown of the season, along with Gostkowski’s extra point, gave the Patriots a 14-0 lead with 10:40 left in the second quarter. The Broncos cut the lead in half with a 10-play drive that ended with a 19-yard touchdown run by Ronnie Hillman. It came not long after Patriots linebacker Dont’a Hightower left the game with a knee injury. Hightower did not return to the game, so add him to the list of Patriots dealing with injuries. It’s a list that grows longer by the week, and now includes a player in Gronkowski that, aside from maybe Brady, the Patriots could least afford to lose. 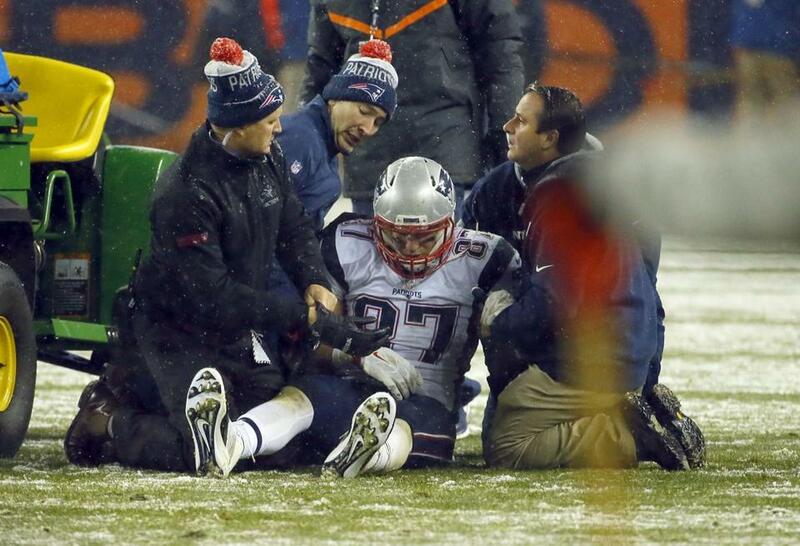 On football: Was Rob Gronkowski’s injury a knockout blow? Michael Whitmer can be reached at mwhitmer@globe.com. Follow him on Twitter @GlobeWhitmer.